Now that the rush of Christmas and New Year’s jollifications has passed, it seems like mid-January is back to business as usual. No more holiday parties filling the calendar, Christmas decorations decking the halls, or traditions to observe. Business, business, business! I know a lot of people get to feeling a little down when the holidays are over, but (although I adore Christmas) I tend to feel a burst of energy when all things Christmas are put to rest. The house gets cleaned, the gifts and gadgets are put to work, and school and work are resumed. Everything feels in its proper place. Getting back to “normal” reminds me that I really do like my normal life, and opens the door to finding joy in everyday pleasures that get lost in the shuffle of the holidays. 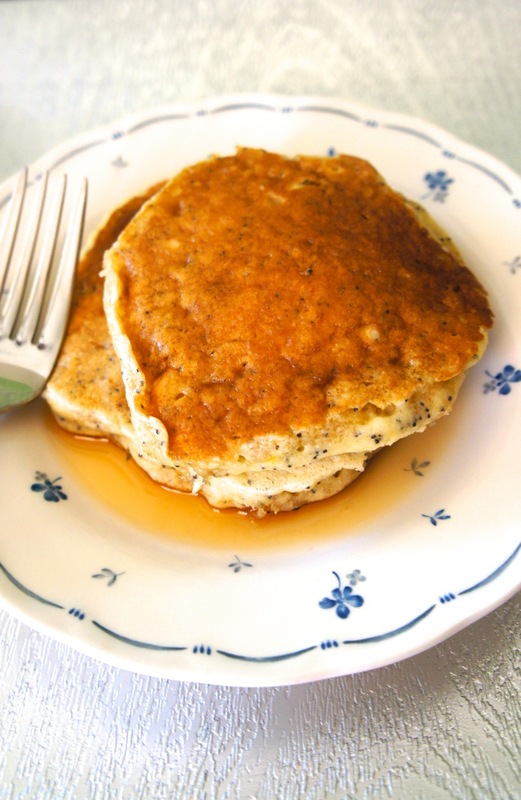 …these lemon poppy seed pancakes are a definite go-to. My husband Anthony is an excellent pancake maker/flipper, and I make a mean batter, so it’s a fun, rare event for us to cook together. 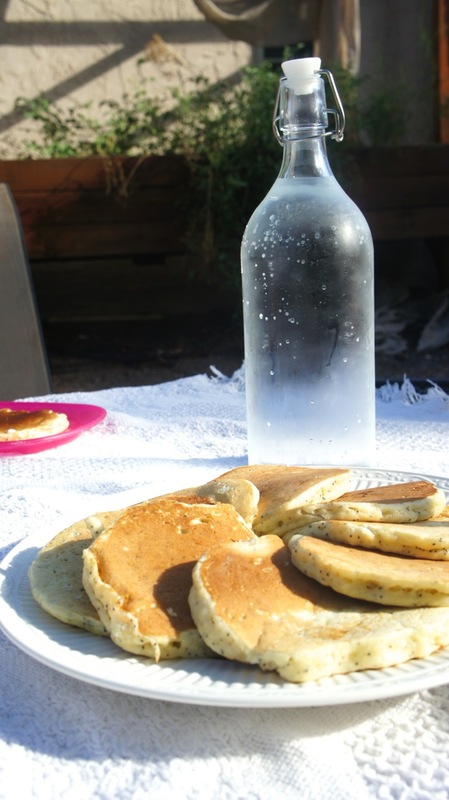 When the weather is nice, we take our stack o’pancakes out back and eat breakfast as a family in the yard. There’s nothing like fluffy lemon pancakes with the subtle crunch of poppy seeds and a drizzle of maple syrup to start a weekend off right. So, you know the classic song “Why Can’t Every Day Be Like Christmas?” where Elvis sings, “If every day could be just like Christmas, what a wonderful world this would be”? Sorry, Elvis, but with all due respect, I have to disagree. I’m happy to get back to my regularly scheduled life. Including Saturday morning breakfasts of lemon poppy seed pancakes with my favorite people. 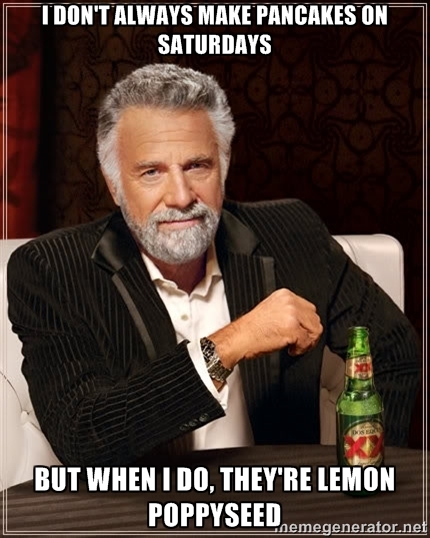 In a glass measuring cup, combine milk and lemon juice. Let stand 5-10 minutes or until milk has curdled. Whisk in eggs, butter, and vanilla. In a large bowl, whisk together flour, sugar, baking powder, baking soda, salt, poppy seeds, and lemon zest. Make a well in the center of dry ingredients and pour in the wet ingredients. Mix until batter is mostly free of lumps (being careful not to overmix!). Heat a skillet or electric griddle over medium heat and spray with cooking spray. Pour 1/4 c. batter per pancake into the skillet and cook 2 minutes per side, or until golden brown. This entry was posted in Recipes and tagged Breakfast. Bookmark the permalink.